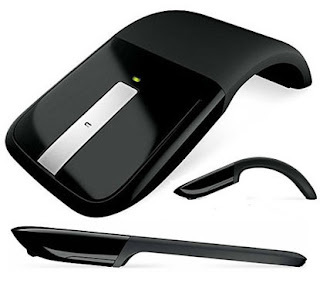 Microsoft has unveiled the Arc Touch Mouse. It's artistic, it's fantastic, it's ultra-modern and it's unconventional. The Arc Touch Mouse forms itself from flat to curved shape and ergonomic to every hand. It can be used on any surface. It has 2.4 GHz Nano transceiver and Microsoft BlueTrack technology for wireless setup. Flexibility in shape is what makes this mouse unique from others. It's therefore extremely portable too. Microsoft obviously tried to retain the effect – using haptic feedback to make little vibrations and a little speaker to make little clicks, all to simulate the feel of a mouse wheel. A single charge on 2 AAA battries would last six months. As of right now, this Arc Touch Mouse is available as pre-order and special pre-order rate is $69.95 on major online retailers like Amazon.com. Expected shipping is on December of 2010 and price gonna go up next year if you missed the pre-order.